A new marina is on track to officially open to the public at The Yards this weekend. 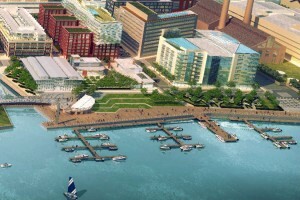 The Yards Marina (301 Water St. SE) is is scheduled to open this Sunday with 50 boat slips, docks for smaller personal boats, residential units, retail and dining spaces, according to a press release. The event will include boat and kayaking excursions, tours of the marina, activities for kids, live music and food. WHAT: The grand opening of The Yards Marina, hosted by Forest City in collaboration with Living Classrooms. The DC metro area is invited to a free afternoon of family-friendly activities along the Anacostia River as part of the Marina’s opening day celebration. The Yards Marina features 50 boat slips with dockage for boats up to 125 feet in length, a water taxi dock, an education dock and a paddler dock for kayaks and smaller personal boats. Half of the slips are designed for long-term, seasonal use, while the other half are intended for short-term occupation of ten days or less. Transient slips are available for the opening event at no charge. Space is limited; please contact Living Classrooms at 202-488-0627 to reserve. WHO: The Yards, DC’s most exciting waterfront neighborhood for living, dining, shopping, relaxing and now boating and water activities. Living Classrooms will serve as a nonprofit partner, managing the marina’s educational programming as part of their youth outreach and as an employment venue for students participating in their job-training program. WHERE: Yards Park | 301 Water Street SE | Washington, DC 20003. Directions can be found at www.TheYardsDC.com/explore/map. The Yards is metro accessible via the Navy Yard Metro on the Green line and Capitol South Metro on the Orange/Blue line. Parking is available on The Yards’ surface parking lots. WHY: Enjoy a summer afternoon on the water with family and friends, and complete your day with a meal at one of the many restaurants located within walking distance at The Yards. HOW: The event is free and open to the public. The Yards is a development of Forest City Washington which, at full buildout, will feature 3,400 places to live, 400,000 SF of retail, dining & services, 1.8 million SF of office space and an award-winning waterfront park spread across approximately 25 buildings situated on 48 waterfront acres in the Navy Yard district. The neighborhood blends the historic feel of former Navy Yard industrial buildings given new lives through adaptive reuse, with sleek all-new construction components. Additional info can be found online at TheYardsDC.com. Follow The Yards on Facebook, Twitter and Instagram @theyardsdc. Outdoor Retailer REI to Host ‘100 Days of Outdoor Events’ in D.C.